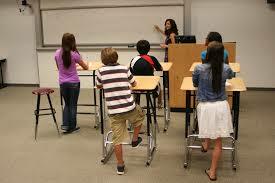 Will Standing Desks Work In Schools? For the 2015-1016 school year Vallecito Elementary in San Rafael, California will be the first school in the country with all standing desks. 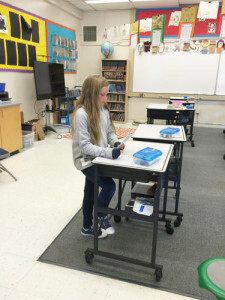 The standing desks movement was initiated by 2 parents at the school, Juliet and Kelly Starrett, co-founders of a Cross-fit gym. It’s been said that sitting is the smoking of the younger generation. According to the CDC, in 2012, more than one-third of children and adolescents were overweight or obese. First Lady Michelle Obama has started the Let’s Move Campaign to encourage kids to be active. Are standing desks the answer? I did a study of my own. Instead of writing this blog seated at my desk, I did it standing. I immediately felt a surge of energy when I stood up. The adrenaline sparked so much zest that I ran into the kitchen! After 4 trips back and forth (and lots of Cool Ranch Doritos), I decided to sit back down. Sitting at my desk resulted in being distracted easily with my laptop and an hour of social media surfing. My experiment was a fail. Reflecting on my elementary school days I think standing desks would’ve been good for me. I bore easily sitting in one place for a prolonged period of time. Lets face it, I don’t even like getting my nails done bc I can’t sit still. WHY would I want to be seated and listen to a lecture about the Periodic Table? At least with standing desks, you can stare at all the cute boys’ butts. The world is watching (probably from our seats) to see the results of the standing desks.